Really long day on Tuesday started at 6am when I worked though my emails, made my final notes for the day ahead of a quick blog and out for the hour’s drive to Endeavour House, Ipswich for the first meeting of the day at 9:30am finished just in time for a cup of coffee and straight into the Cabinet meeting at 11am with about 10 debates, votes and lots of public questions ahead, quite a mammoth meeting with an agenda which ranged from consideration of the final pyramid of the School Organisation Review (SOR) to the back office HR processes; so very external items which attracted a number of public speakers to some very internal structural things, I predicted it would take until 5pm, I was wrong it finished at 5:30pm. There was a packed public gallery and most were there for the SOR debate and most had been at Monday evening’s meeting. After the public questions and thoughtful replies from Cllr. Graham Newman who is the cabinet member for Education, we got down the business of considering the Cabinet paper, for me and as I said yesterday in 2007 I voted for the SOR programme and since then I have consistently voted for the pyramid changes as we have gone through the process, and I chaired the Forest Health pyramid meetings. So for me to vote differently I needed to have heard such new information that outweighed that I had before, to vote different. Over the past couple of weeks we have seen SATS an action group formed to argue against the proposals for Bury St. Edmunds, Stowmarket and the surrounding schools emerge @SATSinfo & @suffolkaction www.suffolkaction.org.uk and if you have read my blog you’ll know I went to their public meeting on Monday. I talked about the changing context of the new Government’s strategy on Schools and the emergence of Free schools and Academies. I also said it was true to say when we started the process in 2005 our position in the results league tables at Key Stage 2 and 4 was considerably higher and indeed that since our position has progressively got lower but importantly our Suffolk School’s performance is better and improving both in terms of pure results and Ofsted reports but that improvement is not happening as fast as in other local authority areas hence our slippage in the league tables; later in the debate Cllr. Graham Newman made an interesting point that if 30 pupils had achieved the 5 good grades GCSEs with Maths and English amongst them, the litmus test, we would be mid table at about 90th; still nowhere near good enough but it does indicate the narrow band between middle order and 3rd from bottom. I went on to say that throughout the process I voted for the SOR proposals and have voted for the changing of the system for 3 to 2 tier re-organisation in each area as the they have come through over the past few years; so accordingly I needed to hear that things have fundamentally changed or new evidence has emerged, to vote differently now. I talked about other authorities and that as others have looked at this, each have come to the same conclusions Suffolk has, and where it has no be changed that was more to do with political expediency that if the change is right or wrong for educational reasons. Today there are under 200 middle schools in a system of some 30,000 schools ad I think this is a factor, Education is arranged on a 2 tier model and Key stage 2 and 4 are tests and indicators that come at the end of the two tier system (with the former Key Stage 3 having been dropped precisely because it was mid-way through the two sets of key tests). I went on to say that on Monday evening one speaker spoke of Eton and how that was 3 tier and whilst I have heard the public school argument before, so nothing new, I think we would all wish that Government could provide the sort of money Eton charges to provide educational and the level of intense Pastoral care that they can afford to offer, but Government simply can’t and so I do not accept that argument. I concluded my comments by saying that there is of course a need to focus on Education, that is what ‘Raising the Bar’ was commissioned to do and its commissioning was long before we knew the latest results and the position that provides in the league table. I finished by saying that in my opinion I have heard nothing new to change my mind, I have always listened and remained convinced that the original decision we took was the right one based on the evidence before us and so I would be voting for the proposed changes in the paper and did so when the vote came. I attended a really interesting meeting last night at the Apex in Bury St. Edmunds. It was organised by a group called S.A.T.S. Not my patch of course but given the debate later this morning I thought I would pop along to see what was being said and indeed if there was anything new I could add to my deliberation later today. I took lots of notes and then spent a couple of hours last night re-reading the original papers in light of what was said last night. I was joined by a number of my fellow Cabinet members and Councillors and candidates; others wanted to be there but such is the way of these things some were as is usual attending other meetings, indeed for me it’s quite rare that I don’t have a Parish or community meeting to attend on a Monday night. One of the interesting aspects of the meeting was that social media principally Facebook and twitter @SATSinfo & @suffolkaction was used to advertise it along with more traditional word of mouth and the usual posters. 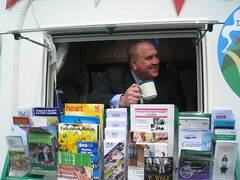 They have also set up a web site www.suffolkaction.org.uk to widen their views on the subject. That’s why we had such a good crowd and I counted it at about 200 or so, which was actually hardly hugh numbers given the area of the pyramid and that so many schools effected were within walking distance of the venue. Of course as is usual at the end of such event I was challenged as to what I know about the subject and I reflected back some 7 years now to the first drafts of the cross party Policy Development Panel (PDP) report about the different areas in Suffolk with two tier schooling and 3 tier; convened simply because it was and is stark that 2 tier areas outperform 3 tier areas. It drew the conclusion that we should make the change to a system 2 tier and that this should happen in phases to allow for learning and the capacity of the team to support schools and pupils through the process. Since that time of course, the last remaining few Local Educational Authorities (LEA) with the same issues or say a whole three tier system have gone through the same process and almost every single one has come to the same conclusion. Equally the recently published league tables show that whilst Suffolk is improving it is not improving as well as the rest of the Country something we recognise and are doing something about. As far as I can recall there were about 4 meetings where we initially discussed and had presentations on the policy proposal, then came the public meeting I recall attending other meetings in Bury St. Edmunds and Haverhill and chairing two of them in my area; next came the cabinet meeting and full Council debates as we adopted the proposal as policy. When time came for my area to reorganise I attended every single by one of the school’s public meetings so I think that was 7 meetings and more importantly I chaired the 100 or so people who came forward to work out how exactly to implement it in Forest Heath’s area and I seem to recall we meet 6 times. On top of that probably read some 300 or so emails, 3 web sites, and I would imagine well over 1,000 pages of written reports and evidence, most notably from Head teachers from across the two and three tier pyramids. So I think I am reasonable well placed to do what I was elected to do – think about the subject at hand and to vote for what I believe is the right way forward. Of course recently we have seen the disappointing drop in the league tables and third from bottom does not make for comfortable reading. I have elsewhere in my blog talked about the Raising the Bar initiative and all I am going to say about that is that it was launched long before we knew last year’s results nor where were in the league tables as they were not made public to you and indeed us until January this year. Not to mention the rise of Academies and Free Schools following the change of government. So in light of the improving but not improving anywhere near fast enough figures and the changing landscape; the question to my mind is does this change the premise of the original decision or not – I was there last night to listen, take notes go home and form my opinion, as I was sort of elected to do and this afternoon I shall be there in Endeavour House to debate and then vote for what I think is the right way forward. 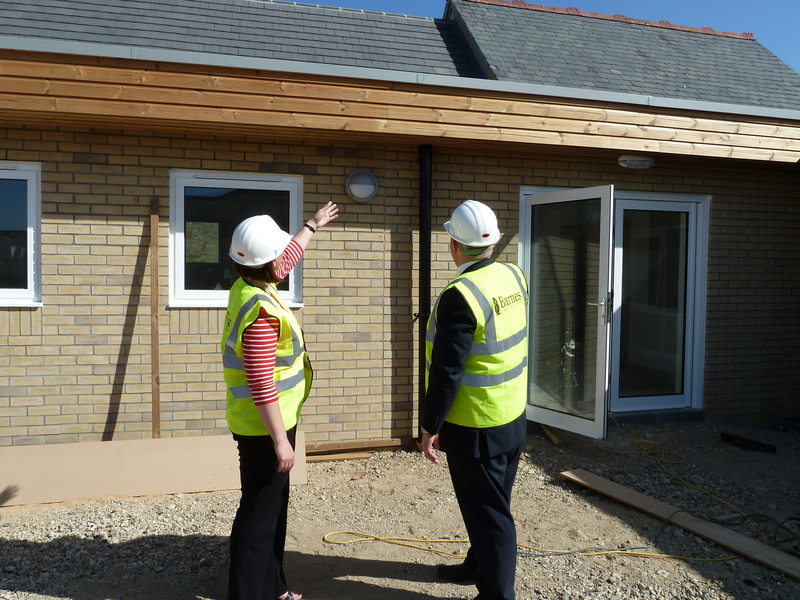 Head Teacher Emma Vincent pointing out how the new building matches in with the original victorian building. It’s been a busy week but I have a chance this morning to update my blog, on Monday morning, fresh from the local elections I vistied Lakenehath Primary school to have a look at the increasing traffic problems and a tour of the new school buildings which represent an investment in the village of over 1 million pounds as the schoool gears up for the oldest children to stay put rather than move to middle school in Mildenhall as part of the reorganisation of our local schools from a 3 tier structure to a 2 tier one, when we embarked on this change I said I wanted it to be accompanied by high quality new school buildings and we are delivering on this. I think parents will be just as proud as I am of the upgrades to our local primary schools in Lakenheath, Beck Row and West Row; even in these difficult times we are investing in the future of our Children’s education just as we promised we would. I agreed that I would ask county highways officers to look again at the double yellow lines and how they could be extended to make sure inconsiderate parking does not block the local roads around the school and I discussed with the head Teacher Emma Vincent the school travel plan and how to get parents to allow their older children to walk to school or parents to car share as they bring the younger ones to school. I was particularly interested in the new IT suite where pupils will get to use the latest computer equipment and occassionaly l I realise how old I am as I can remember at my school, a friend of mine brigning in the first Sinclair calculator with its purble screen lit by little filiments that formed the digits and me thinking well that the end of the slide ruler! OMG I am showing my age, now where’s my blackberry!, see I am not that old! but more importantly where are my glasses as I can’t read a thing on the screen!